The first M&L year is ending… what did pupils think about it? What a fantastic start for our project! More than 200 students participated and around 80 of them traveled to meet their twinned research partners during a week. What did they think of their experience? Lets find out here. I had a good time during this year with maths en jean. Indeed, it was the second time I participated to the maths project but I was still excited by meeting new people and traveling to Romania. First, the travel in Romania was wonderful and I met very nice people, I was so happy to see again my penfriend Miruna, and I was also glad to welcome Radu in my house. Then, we went to a congress in Montpellier and it was nice, I had fun with my friends and I had a good time with Radu, it was a very good experience. The congress was fine, I learnt many things and I met people that I’ll never forget. About maths en jean working group, i was a bit scared at the begining because there were a lot people and I didn’t want to lose the feeling that we had last year because we were not many people but actually I m very happy to be friend with girls and boys from maths en jean. And I don’t have to forget that I joined maths en jean because i love mathematic and I think I’ll go back next year to work (and work harder) about a maths subject (by the way, the subject was deeply interesting). Inès Canal, Lycée Aragao, Perpignan. This was my third year in the math research workshop and, as every year, I gained a lot of experience, I learned new things and I made a lot of new friends. The research topic was very interesting, even if it wasn’t the one that I first wanted to study, but in the end, we succeeded in finding its solution. In the beginning, we didn’t have so many ideas about the way in which we were going to solve it, but in time we managed to find the solution using our mathematical knowledge and comparing our work with the French students’ work. 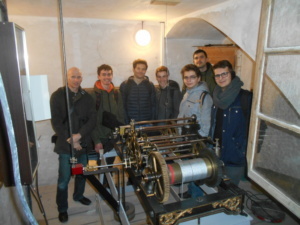 The Padova Congress was a very pleasant experience for me; I saw a different way in which mathematics can be studied, I met new people and we had a good time. It was very encouraging for me and it was a unique opportunity to present my work in front of a large public. All in all, being part of the M&L project gives us the opportunity to study mathematics in a new way using all our knowledge. Besides this, we have the chance to use information from other subjects and to improve our linguistic skills, but also to establish new friendships with people who want to study the same things with you and have the same interests. Stinian Georgia, Colegiul Naţional Emil Racoviţă, Cluj-Napoca. Within the Eramsus MATh.en.JEANS project, we had the great opportunity to work on a research theme with students abroad, to take part in an international mathematical congress and to get to know the rich culture of developed countries such as Belgium and France. The project has an excellent formative purpose for students, and this way they practice not only mathematical abilities, but aslo communication, socialization, or teamwork skills. 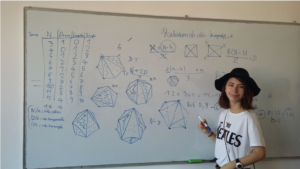 As a result of this mobility, I learned to focus on a mathematical theme and to work in a team formed by both our school students and foreign students. It is also a unique way to get to know the culture and tradition of another country, and an important role in this was played by the family of Belgians who hosted me in the most welcoming way possible. I had the chance to experience their lifestyle on my own and have perfected my communication and socialization skills. 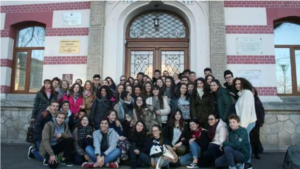 The experience of an Erasmus program is something unique and I recommend it to everyone who is given this opportunity. Article suivantA second transnational meeting to end the first school-year!